INSPHERE are rapidly expanding and we are pleased to be recruiting for a number of roles that will support the business, our growing portfolio of metrology projects, and the development of metrology technologies. We are a growing company having doubled in size in the last two years, a rate which is set to continue. We are looking for candidates that have the ambition and proactive approach to help lead this development. INSPHERE is an innovative SME, focusing on the development and implementation of metrology systems into high value manufacturing processes. We work across a range of industries including Energy, Automotive, Medical and Aerospace. To apply please send an up-to-date copy of your CV for consideration stating your availability/notice period. In a series of articles, we are taking a look back at the industrial revolutions of the past to glean lessons from history as the Fourth Industrial Revolution gathers pace. Part one released in December introduced the series and in this article, we now look towards the first revolution. The First Industrial Revolution began in Britain in the late 1700s. It was a period of disruptive economic, technological, social and cultural change, and spread quickly to Europe, the USA and beyond during the first half of the next century. To say that the world was transformed would be an understatement. The changes in manufacturing, shifting from hand-crafting goods to the use of machines was accompanied by many fundamental new manufacturing techniques and a flourishing of infrastructure and trade. Read more. Laser trackers are the obvious choice for large scale inspections that require high accuracy. They are an established, trusted tool for the measurement of components and assemblies that are too big to fit under a CMM. However, laser trackers are often under-utilised within organisations and could be used more effectively, in more applications. In some cases, your laser tracker could allow you to save money and add value to your processes. Read more. Previously the Managing Director for Güdel UK, a multi-million pound automation company providing solutions in advanced manufacturing, Gary joins INSPHERE to lead the sales and marketing. He brings a wealth of business development experience and knowledge of advanced manufacturing industries that will be instrumental in bringing our product portfolio in development to market - we are delighted to welcome Gary to the INSPHERE team! 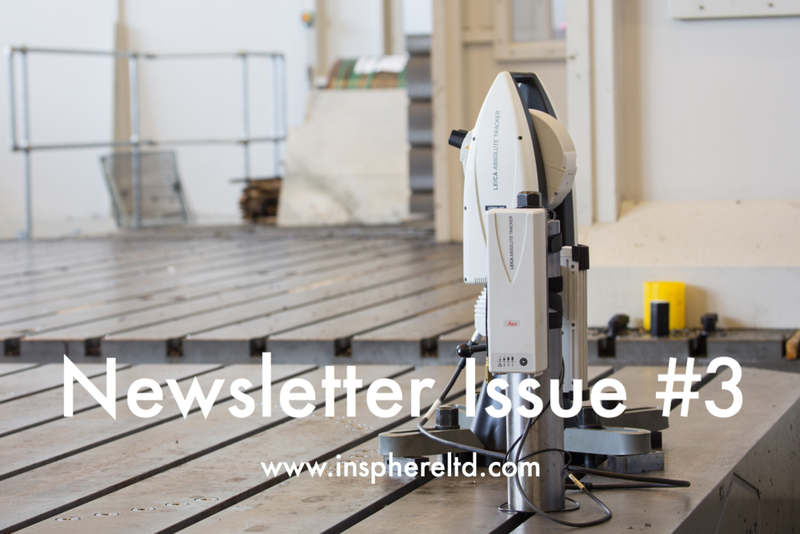 Over the past 12 months, INSPHERE have been working with the Nuclear Advanced Manufacturing Research Centre at their world-class facilities in Rotherham to develop BASELINE, a new system that can verify large machine tools in less than one hour. The Nuclear AMRC is part of the High Value Manufacturing Catapult, an alliance of seven leading manufacturing research centres backed by Innovate UK. It is a centre that successfully combines academic innovation with industry expertise to help manufacturers improve capabilities and performance along the supply chain. The centre’s Soraluce FX12000 horizontal machining platform, which is capable of working on components up to 12 metres, is the largest of its kind within the UK available for collaborative R&D. INSPHERE have put the Soraluce machine through its paces and conducted a series of large-scale trials to test the BASELINE system and also benchmark its technology against current market offerings. On March 21st, INSPHERE will be returning to the Nuclear AMRC to launch the BASELINE system. The event will include technical presentations from INSPHERE, Nuclear AMRC, and equipment provider Hexagon Manufacturing Intelligence. There will also be shop floor demonstrations of the BASELINE technology. The event is free to attend but spaces are limited. BASELINE is a system that reduces machine downtime and material scrap rates. The technology provides full verification of a large machine tool in less than one hour. It facilitates regular checks and provides confidence in performance prior to cutting. The product system supports a move towards adopting Industry 4.0 philosophies on the manufacturing shop floor. For more information, visit www.insphereltd.com/baseline or contact us to discuss your business requirements for machine tool verification. This logic is flawed, of course. It is only through a deep human understanding of manufacturing processes that a shift towards automation is possible at all. The companies and industries that invest in skills and training will be the ones that make the fastest advances in automation. Read more. Richard Kingston is and INSPHERO who joined early last year. Here’s a little interview to help you get to know him a little better. Industry 4.0, or the Fourth Industrial Revolution, has been discussed a great deal in 2018. At INSPHERE we feel that Industry 4.0 will indeed live up to the current hype, and that metrology data will be the key enabler that delivers truly smart manufacturing and drives productivity to a higher level. Can revolutions can be mapped out in advance? Do they truly drive changes or are they just the result of incremental development? These questions are still relevant today – they may help us to take an objective look at whether i4.0 is just marketing jargon or a genuinely transformative event. To help answer these questions in the context of the present day, INSPHERE will be releasing a series of articles over the coming months, looking both backwards through history and forwards into the short and medium-term future. Read more. Made Smarter, an independent review commissioned by the government and released last year, identified the positioning of the UK with respect to the Fourth Industrial Revolution. Since its release, over the last 12 months it has been impossible to discuss the future of manufacturing without hearing terms like Industry 4.0, the Internet of Things (IoT), Machine Learning or Big Data. The terminology, branding and messaging has come to the fore of the manufacturing conversation. However, the over-arching sentiment that seems to have been established is clear: collect data and use it to improve your manufacturing system. Read more. I am a Principal Metrologist at INSPHERE with my main focus on the research and development of novel metrology solutions for high value manufacturing processes. Read more. There are many reasons to attend conferences: a chance to build our networks, to learn about new systems and new applications of metrology, to push forward the academic cutting-edge of the field, or to build an awareness of the products and services that are on offer to the industry. These are just a few of the obvious ones. Read more. In the latest issue of Composites in Manufacturing magazine, INSPHERE’s Chief Technical Officer, Oliver Martin discusses the importance of ensuring simulation matches reality in cutting-edge composite manufacture and explains why automated systems hold the potential for unique processes that are faster and more accurate. The third issue of INSPHERE’s quarterly newsletter is now available here. This issue features our regular update of what’s been happening at INSPHERE, training dates for the rest of the year and for all of our courses in 2019. We also have our three most recent articles from the team discussing the benefits of workplace training, how to achieve better portable arm measurements, and how to improve your laser tracker processes. There’s also a case study on how INSPHERE have provided support for metrology process development to solve measurement challenges in a research and development facility. Our next newsletter will be out in the new year and if you haven’t already, you can subscribe to get the next issue delivered straight to your inbox! At the start of the year, we expanded our team of INSPHEROs. Here's an interview with one of our specialist metrology engineers who is also one of our NPL Dimensional Measurement trainers. A popular board game in the 1980s famously took, "a minute to learn... a lifetime to master". Portable arms are a deceptively simple metrology system for which the same catchphrase applies. Arms are designed to be highly flexible and easy to use for a wide variety of measurement tasks. However, understanding measurement datasets and how to use them for verification, reverse engineering or any other application can be far more involved than it first appears.